New Years Eve Traditions, Mexico Style! We were just finishing up a late breakfast this morning when a pickup stopped in front. It was our friend Rick from Rick's Bits 'n Bytes, Pics and News stopping in for a visit with Rylie. Rylie quickly found a comfortable spot on the back of the couch where she could watch the neighborhood while us humans chatted. Rick did a couple of tweaks on my computer that will make life easier for me. Rick and Paulette are staying at The Sands, just down the road from us and Paulette was off on one of her excursions so Rick and Rylie decided to come and find us. It was a nice visit. Just Wait, It Will Get Warmer! The nights are... what is the word... COLD! It warms up by noon, usually enough to walk around in shorts and t-shirt. The pool and hot tubs here are fed by the thermal hot springs and are always very warm and are open all night so we can always walk the fifty feet to the pool complex and have a quick dip in the hottest tub to warm up. That is what I did at about 9:00 PM last night. We do not know what we are going to do after January 18 when our time here expires. We could renew for another month or we could head out over to Arizona. Our options are open and a lot depends on the chart above. We have had some wind lately with the motorhome rocking and rolling a bit. Mornings have been cool enough to justify long pants but it only lasts until eleven or so and then it warms up and the shorts come out. Our friends Rod and Sylvia are in Apache Junction, AZ and are getting some below freezing nights so it could be worse. The excitement around here this morning was moving a 40 foot rig into a spot across the street. A couple from Pennsylvania sold their older class A motorhome and bought a 40 foot 5th wheel locally. It was a bit tight getting it in but with six guys watching and one guy working it went well. It has been pretty quiet around here. The Christmas potluck was well attended with way too much food. Norma and I got roped into selling 50/50 tickets at the door and managed to raise $73 for the Social Committee. It is a good way to meet everyone. We are five weeks into our stay here, the longest we have ever stayed anywhere for many years. The weather is good, the people friendly and the pools hot. What is not to like? Another sunny day in the desert. Life Is Good. I dug out the disks, put #1 in the optical drive and hit power. It recognized the disk and asked if I wanted to restore the computer from the set of disks or from the Recovery Partition! I told it from the Recovery Partition and away it went. It eventually opened up like the day it was born. I installed Chrome and MSE Anti Virus and it is working! My work was interrupted when I could not convince Norma that fixing the computer was more important than going to the potluck Christmas Dinner here in the park so I had to leave it in a state of limbo for a couple of hours. It was still alive when I got back and is now busy downloading updates. I will let it do it's thing overnight and re-start it in the morning. Maybe I will end up with a reliable backup computer! All this reminds me that I better make a set of backup disks for the new computer. Do we still do that with Windows 8,1? I will find out. Here it is Christmas Eve already! We managed to talk to Brooks, LindaLee, Jayde and Sierrah on Video Skype this morning and Norma got hold of her brother in the hospital in Victoria so it was great to talk to everyone! 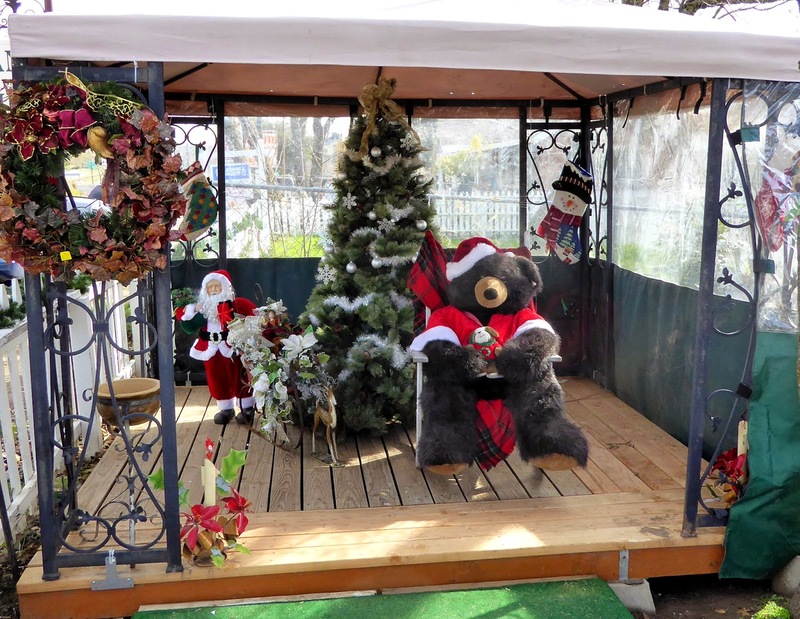 The photo above was taken on a drive to nearby Julian, CA where a friendly bear is standing in as Santa's Helper! He says, "Have a Gurrrrreat Christmas!" We are having some friends from the park over for snacks later today so Norma is busy digging treasures out of the freezer. 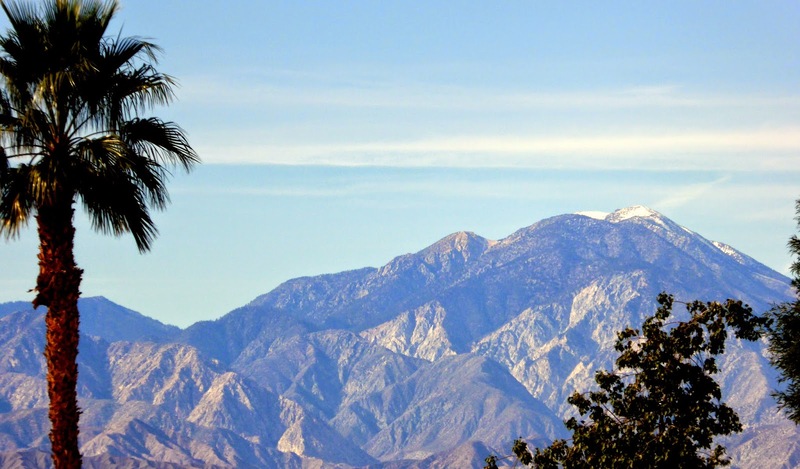 It will be a nice, warm evening here in Desert Hot Springs so we will do it all outside! We want to take this time to wish a Very Merry Christmas to all our family, friends and readers wherever you are! We are also having a bit of a White Christmas! There is a little snow on one of the peaks way off in the distance! You have to look closely to see it! 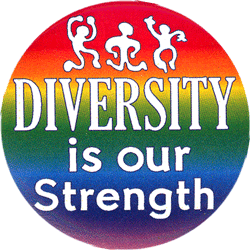 I just had to re-post this video from my friend Bill's Blog. So long Joe Cocker, you were one of the best! Few entertainers put so much of themselves into their music. Janis Joplin is one other one that comes to mind. You have not been subjected to much Mexican "stuff" on this Blog for quite a while but I want to share this write-up of how Mexicans celebrate Christmas. In many Latin countries there are actually 12 days of Christmas with much of the gift giving done on Three Kings Day. Many will be partying from before Christmas until after Three Kings Day. Lots of fireworks. Lots of drinking. Gunfire New Years Eve. Here is a little more………. January the 6th is a special day in Mexico. Known as 'El Dia de Reyes' (Three Kings Day), this holiday represents the height of the Christmas season. The date marks the culmination of the twelve days of Christmas and commemorates the three wise men who traveled from afar, bearing gifts for the infant baby Jesus. The children of Mexico in particular look forward to this holiday as traditionally, gifts are exchanged on this date, not on Christmas day. In Mexico and many other Latin American countries, Santa Claus doesn't hold the cachet that he does in the United States. Rather, it is the three wise men who are the bearers of gifts, who leave presents in or near the shoes of small children. The holiday is also known by the name of the Epiphany which dates back to the 4th century. A grand feast would be held on this day to honor the occasion of Jesus' baptism and to pay homage to the three wise men. Many believe mysterious events preceded Jesus' birth with perhaps the most notable being the appearance of the Star of Bethlehem. This new star appeared in the evening sky just prior to the arrival of Jesus. Three wise men or Magi as they were then known, whose names were Gaspar, Melchior and Balthasar, traveled a far distance to pay homage to the Christ child. They brought with them fine gifts of gold, frankincense and myrrh. Three Kings Day remains an important holiday for the people of Mexico. In addition to the gift-giving aspect of the day there is also a culinary treat that is specific to the holiday. Known as 'Rosca de Reyes' (King's Cake), this holiday dessert offers much in the way of symbolism. Shaped in the round to signify a king's crown, this sweet bread holds a special surprise. Baked inside is a small plastic figurine representing the baby Jesus. Whoever finds this token is obligated to host an upcoming party for the occasion of 'Dia de la Candelaria' (Candlemas Day) which occurs each year on February 2nd. The effigy of the baby Jesus, hidden inside the cake, represents another aspect of the holiday. The reason Jesus is 'hidden' inside the bread is to symbolize how in life, the Christ child's birth location also needed to remain secret, in order that his life be spared. The ruler of Jerusalem at the time, King Herod, had been appraised of the mystical signs that indicated the new and rightful King of Jerusalem was soon to be born. Herod's reaction to these predictions was swift and horrible. He ordered his minions to murder all male infants recently born in Bethlehem. However, as destiny would have it, Mary and Joseph found their lodgings in a manger, not an inn. Herod's henchmen didn't think to look for an infant in such a location. Another lovely custom associated with the Three Kings Day holiday centers around the evening meal. Traditionally, the supper served on this special day is delicious corn tamales accompanied by hot chocolate. This makes for a perfectly quintessential Mexican meal and one that is enjoyed by everyone in attendance. Western Christianity celebrates the Magi on the day of Epiphany, January 6, the day immediately following the twelve days of Christmas, particularly in the Spanish-speaking parts of the world. In these areas, the Three Kings ("los Reyes Magos de Oriente", also "Los Tres Reyes Magos" and "Los Reyes Magos") receive letters from children and so bring them gifts on the night before Epiphany. In Spain, each one of the Magi is supposed to represent one different continent, Europe (Melchior), Asia (Caspar) and Africa (Balthasar). According to the tradition, the Magi come from the Orient on their camels to visit the houses of all the children, much like Sinterklaas and Santa Claus with his reindeer elsewhere, they visit everyone in one night. In some areas, children prepare a drink for each of the Magi. It is also traditional to prepare food and drink for the camels, because this is the only night of the year when they eat. In Spain, Argentina, México, Paraguay and Uruguay, there is a long tradition for having the children receive presents by the three "Reyes Magos" on the night of January 5 (Epiphany Eve) or morning of January 6. Almost every Spanish city or town organises cabalgadas in the evening, in which the kings and their servants parade and throw sweets to the children (and parents) in attendance. Every year thousands of horses from all over Mexico make the peregrinacion (pilgrimage) to Cubilete near Guanajuato - then a cabalgata to the top on or around Three Kings Day. (Many pictures online). El Cerro de Cubilete (Cubilete Hill) is located 15km west of the city of Guanajuato in the heartland of Mexico, a region known as the Bajio. At 2,579m (8,460 feet), Cubilete Hill is the highest mountain in Guanajuato state and thought to be located at the exact geographic center of Mexico. Marvel at the towering Cristo Rey (Christ the King) statue, a 20m (65 feet) monumental sculpture, religious site and museum situated atop the summit of Cubilete Hill, and enjoy stunning panoramic views of the surrounding area. The statue faces the city of Leon and can be seen for miles. Erected in 1950, the bronze Christ the King statue is one of the most historically important religious shrines in Mexico. It replaces a smaller statue that originally occupied the same spot atop the hill and was destroyed during the Cristeros War, an uprising against the Mexican government over anti-Catholic provisions added to the Mexican constitution during the first half of the 20th century. Today, the Christ the King statue is a favorite Guanajuato attraction. Its history and location at the heart of the country hold significant importance for the people of Mexico and each year in early January thousands of people make the pilgrimage to the shrine to celebrate the Epiphany. We were sitting out with some neighbors yesterday evening when suddenly, "Whoosh", a tiny hummingbird flew right past my nose! He had a branch picked out in the hedge and I was sitting between our feeder and his perch. He was giving me fair warning that this was his flight path and that I was in it! I saw him in the hedge and he did not seem to be in a hurry to leave so I quietly got up to get my camera. He waited patiently while I sat back down and found him in the finder. He is only an inch or so tall so it took a minute to find and zoom in on him with a high magnification level of 50X or so. The light was not good as the sun was setting behind the hedge he was in so the camera insisted on setting a high ASA setting which introduces some grain as well as delivering less contrast that the scene deserved. I managed to add contrast with Picasa so here is the best I could do at the moment. I will keep my eye open for a better chance as he seems to be happy here on our patio. Maybe he has a girlfriend he will introduce us to. 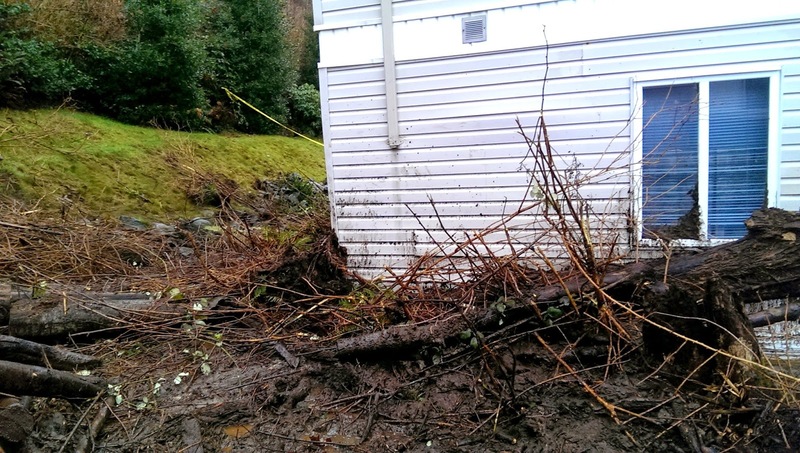 We got a message from our friends back home who report that cleanup is progressing nicely on the mud slide damage. 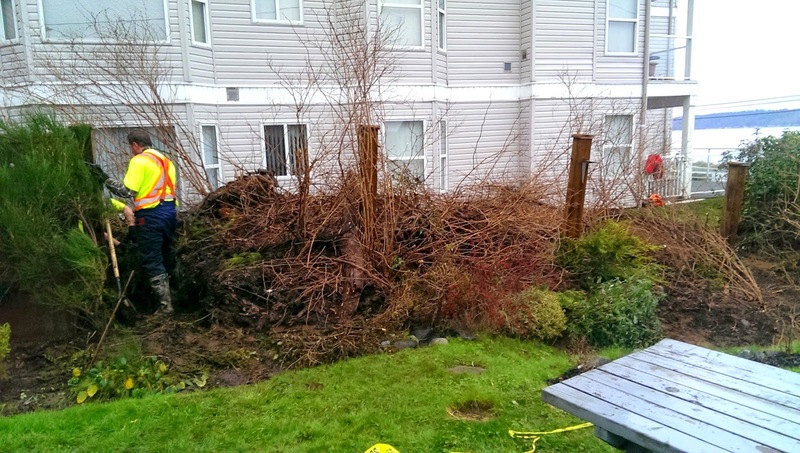 The condo has had their crews working in our yard which is a huge relief for us. They say they they are filling in Norma's sunken rock garden. 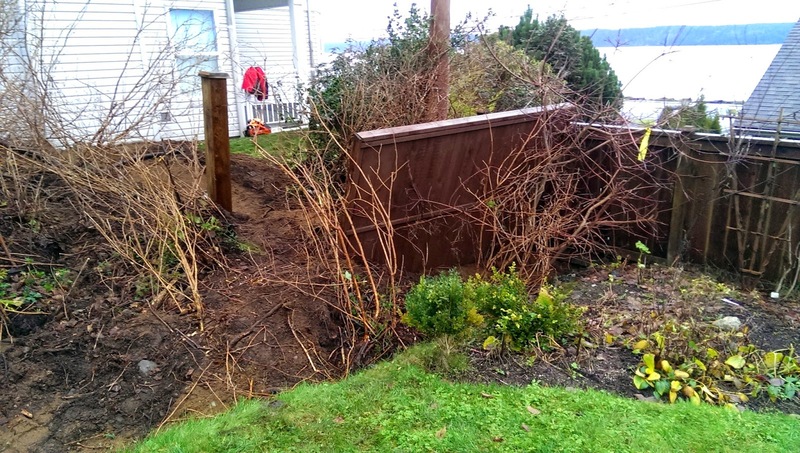 This means that one or two of our fence posts may end up being too short because they followed the old terrain level. I am sure there is an easy solution for this. They are also working on a new drainage system on the bank behind their building in an attempt to stop any future problems. Norma is still worried about all her plants and bushes but Nancy has her eye on them and if any plants can be saved, I am sure they will be. I followed commentor Don's advice and installed Classic Shell. It provides the old Windows 7 Start button that opens into a list of programs, settings, etc. It is also a shortcut to the desktop that hides under the annoying stack of "Metro" tiles. What a dumb idea that was! I know the Windows purists are looking down their noses at me but this is where I am, at least for a while. First post on Windows 8.1. The computer started and asked me a bunch of stuff, most of which I answered. It asked my Microsoft Account information which I don't know. I don't even know if I have one. It let me past that and also let me continue without a password and finally opened into that confusing "Tiles" page. I found Internet Explorer in there and opened it. I immediately downloaded FireFox and installed it. That is where I am now. Posting from within FireFox. Lots to do but I am here. My old Compaq Windows 7 laptop is officially toast. I have tried starting it up many times and it will get no further than the Compaq Welcome Screen. I can't even get the CD/DVD drawer to open to put in my restore disk set. Oh well, it has been giving me problems for several months so it's demise is not unexpected. My friend Rick responded to my email about the Best Buy computer, telling me he saw no reason why it would not do for what I need it for. I went to the Best Buy site to order the Toshiba (not for sale in store but can be ordered and picked up in store) and got as far as the point where it would not accept my Canadian address. I then called the store to order over the phone. Same thing. She asked my address and I asked if she wanted my legal Canadian address or my temporary US address. She wanted my permanent Canadian address which of course her computer would not accept. I then gave her the address of the RV park. Then she asked for my credit card number which I gave her. She then asked if the mailing address on the card was the RV park. No, it is my Canadian address. She then called a "manager" and they figured something out. Now she told me they had to wait for a "fraud check" on the card that could take up to 24 hours. and she would mail me a "pick up code" when (if) I passed the fraud check. Sheesh! I am just trying to buy a cheap computer! Well, it is 9:00 AM, about 18 hours after I ordered the damn thing and still no email. I checked my Visa account on line and they put the charge through about an hour after I talked to them so what is the problem? Well, cleanup is progressing back home. The cleanup crew asked permission to move some light equipment including a Bobcat across our lawn as that is the only access to the damage. We said yes, as long as they agree to repair any damage they do. The workers made some comments to our friends about how amazed they were that the fence posts survived. The panels were all knocked out but seem to be intact and can be reinstalled with minimal work. I asked Brooks what the replacement cost for that fence would be and he said $350 per panel times six panels, so $2,100. Of course that would be a worse case scenario as most, if not all the material should be salvageable so repairs would be labour only plus some minor material. Mud is piled up against one back corner of the house but not over the height of the concrete ring wall so that is not a major concern. Norma had $1,000 - $2,000 worth of bushes and plants on our side of the fence that may or may not survive, only time will tell. About 50 feet of deer fence is gone but we have a left-over part roll of the fencing so we can replace it. 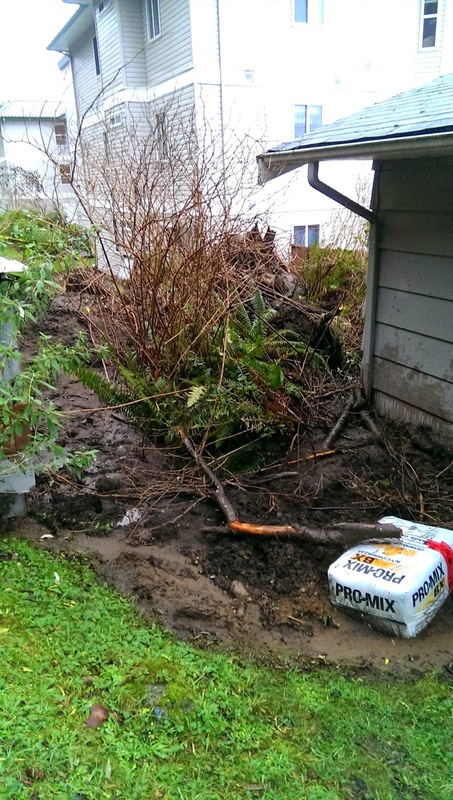 There was a mudslide next door to us back home yesterday! We started getting reports in the afternoon and then friends sent us this photo from the local paper. 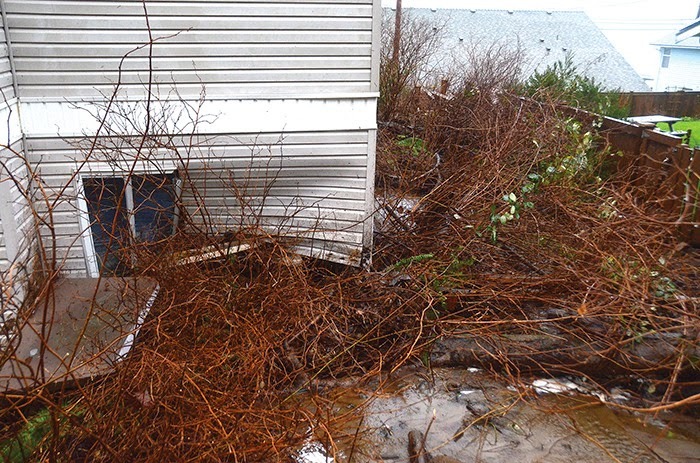 Damage to our house appears to be restricted to the fence and one corner where mud is piled up. We have been talking to the fire department and friends. Details are slow in coming. I will post more when we find out. That is our property on the right (over the fence). Well, we have been on the road for one day short of a month. This year we have made it only as far as Palm Springs, CA and will be staying her for another six weeks at least. Last year at the same time we were in the Rio Grande Valley of Texas visiting with our friends Chris & Juan and Wandering Mike. Last year we were covering much more ground and burning up the gas. This year, not so much. That is a total of $914 savings in the first month alone! Other expenses like groceries, liquor, propane are about the same. It is easy to see that costs can be kept down quite a bit by staying put. But then, I really miss Cajun food and Betty's RV Park! I will do more comparisons as the winter goes on. The most used cupboard, the one the coffee is kept in, had a hinge that has been giving us trouble for some time. I have had to increase the size of the screws and reinforce the holes in the particle board with glue in the past. A couple of days ago, one of the hinges broke and the door was in danger of falling off so it was time to get to work. I found heavier duty hinges downtown and replaced the two that were on the door. I moved the door 1/4 of an inch so I was screwing into fresh wood but as it turned out, the door was mounted off-center from the start so moving it actually fixed it location wise. These hinges were cheap ($2.79 for 2) but are much stronger and better quality than the ones Fleetwood used. I probably should pick up a few more for the "stuff" bin. The other repair I did today was to replace one of the gas filled tubes that holds the outside compartment doors open. There is an RV supply place near here and they had the part for $22. It was a simple task to snap the old one off and the new one on. We decided to reward ourselves for a job well done and went down to Ruby's Diner for dinner. Ruby's is a 50's style diner on the main drag in Palm Springs. It is bright chrome with red plastic upholstery and really looks like an old 50's diner. The only thing missing was a juke box. I learned about Ruby's from Rick's (earlier) Blog and had it on my "must do" list. We stopped for a few groceries on the way home and had a little frustration when the ATM refused to accept my debit card. We eventually found another one that took it so I didn't burst a vein. It is raining here in Desert Hot Springs. California really needs the water so I will not begrudge them but I much prefer it when the sun is shining. Norma was under the weather for the last two days and today seems to be my turn. I will not be venturing far from the toilet today so the rain will not bother me. May as well get the bad weather and poor health over with all at once. To make things worse the hot tubs have been out of service here in the park for a few days. The deep submersible pump that pumps the hot water out of the hot springs source packed it in. Unfortunately, this pump is located in one of the RV sites and the owners of the RV that was blocking access to the pump were away for a few days so repairs were on hold as the park management did not want to tow the fifth wheel out of the way and risk liability issues. Anyway, there is all kinds of action down that way today as the owners came home last night. We will have hot pools very soon, maybe even today.